WILLEMSTAD – The Parliament of Curacao must decide whether they still stand behind the decision of the Island Council of September 4, 2010. This is the purpose of a motion, which was announced by the parliamentary factions of opposition parties MAN and MFK during the Central Committee debate on May 15 of this year. 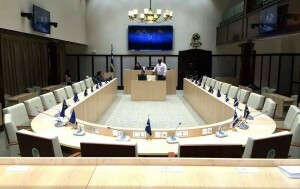 The decision by a majority of the Island Council, consisting of the MFK , MAN and PS spoke out so that the then Executive Council of Curaçao would put a termination clause in the consensus Statute Laws and the inclusion of a procedure in the Statute for the independence of Curacao. The debate seemed like a history lesson of all developments in the political field in Curacao since 1993. The battle of Yes and NO, the struggle between supporters and opponents of the political development in Curaçao in the referendum of 2009, flared up again during the debate. MFK leader Gerrit Schotte wanted to know what the five consensus Statute Laws concerning the police, the Joint Court of Justice, the Council for Law Enforcement, Financial Supervision and Prosecution have produced for the island and its inhabitants since 2010. He urged Prime Minister Ivar Asjes to indicate how the consensus laws have helped developments in the economic and social field. PAR MP, Zita Jesus-Leito, who as a commissioner of the Island Territory of Curaçao has given guidance to the political changes on the island and said that she is proud of what she has achieved. But she criticized the problems caused by the applicants of the meeting, the fractions of MAN and MFK, after the start of the country Curaçao.